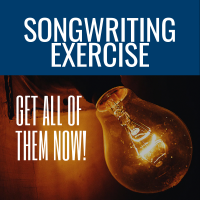 Songwriting exercises help you do a couple of things: (1) practice your songwriting skills so over time the entire process comes more easily, and (2) have techniques in your tool bag to get you beyond the blank page. Below you’ll find some quick drills to sharpen your skills, song prompts to get a full song started, and some longer exercises if you have more time in your day. This one is great to use if you’re stuck on a song and works pretty quickly. The goal is to force you to find new words or ways to phrase what you’re trying to say. Have your rhyming dictionary ready! Good song starter if you’ve got nothing. Also a good song starter if you’ve got nothing. This is a great way to give a little twist to how you write, especially if you’re methodical about your lyrics. Nice way to create some variety in your chords and get you out of common patterns or melodies you might use. Creating A Song Idea Habit! Grab a notebook and start capturing interesting phrases you hear, thoughts you have and things that make you go hmmmm . . .
What Makes A Song Tick? For beginner, intermediate or advanced songwriters . . . TIPS each month with examples of how great songs are created using the same techniques! PLUS - marketing tips to help sell your songs and move your music career forward!